Saturday, April 13 is Record Store Day. The annual event has been a crucial part of the vinyl resurgence over the years, and it’s drawn attention not only to records themselves but to the local, unique stores that sell them and the communities that exist around those stores. This year, the creators of Record Store Day have made a limited-edition compilation LP was curated from the classic Sun Record Company catalog by participating Record Store Day stores. 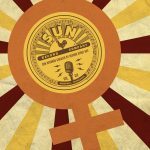 Volume 6 marks the sixth installment of the Sun Records Curated by Record Store Day series and highlights many of the incredible female artists in the Sun Records archive. The track list was carefully curated by the hardworking people in record stores themselves and includes gems from throughout the history of the Memphis label that was so essential to the birth and development of rock n’ roll. This #RSD2019 exclusive release is limited to 4,000 copies worldwide and won’t be released to streaming services. We’re making a digital version available to radio stations to draw attention to the release and to Record Store Day itself. Play some songs on the air, and make sure your listeners know which local stores are participating in this year’s Record Store Day. A full list can be found here.